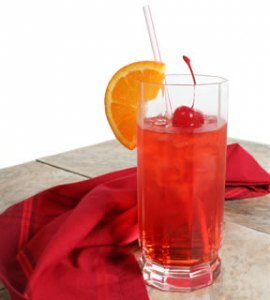 A Shirley Temple (also known as a Grenadine Lemonade) is a non-alcoholic mixed drink made with either seltzer, ginger ale, Sprite or 7 Up and mixed with grenadine syrup garnished with maraschino cherries and a slice of orange. Orange juice is often added, especially in Canada. It is often served to children dining with adults to let them share the experience of drinking a cocktail, which is why it is sometimes called a kiddie cocktail. Left: A Shirley Temple cocktail. The Royal Hawaiian Hotel at Waikīkī in Honolulu, Hawaii claims to have invented the Shirley Temple cocktail in the 1930s. It was named for the famous child actress Shirley Temple, who often visited the Royal Hawaiian Hotel. Several other claims to origin exist but sources consistently claim the drink was invented in the 1930s. Pour the lemon-lime soda and ginger ale into a Collins glass with ice cubes.